When my group met each group member gave suggestions of what theory they thought would be a good idea we decided to create a poster on Person-centred approach. 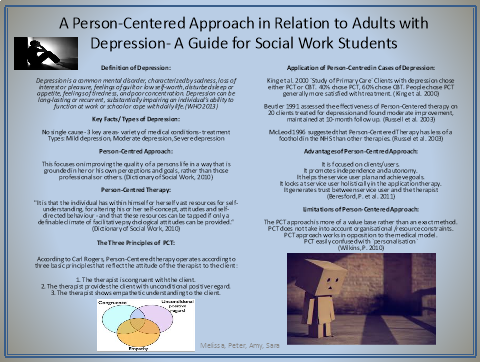 The title of the poster was “A person-centred approach in relation to adults with depression: a guide for social work students. The purpose of developing this poster was to inform and educate social work students about Person-centred approach in a relation to adults dealing with depression. To have an understanding of my role and contribution to the group it is essential to review the process of how the team formed. The group formed not as a result of choice but as a result of random selection but with consideration of where we lived as this would make it easier to come together. The formation of the group made me realise that I did not have a choice in deciding who I would work with but despite that I was happy with my group and we worked well to complete the task at hand. The group was small and consisted of 4 people 3 females and 1 male and with different experience and educational background. A group can be defined in a many different ways which relate to function, membership for instance why people join and whether membership is voluntary and its goals and eventual purpose. Cartwright and Zander (1968) describes the group “as an aggregate of individuals standing in relations to each other, the relations exemplified will depend on or determine the kind of group, whether it is a family, an audience, a committee, union, or crowd”. Hogg et al (2005) defined a team as “a group of people organised to work interdependently or cooperatively to complete a specific or accomplish a purpose or goal”. On reflection it is essential to note that my group was a task centred one because it was purely set up in order to complete the task at hand. Basically the group had collectivism this relates to “a world view based on the idea that the group needs and goals are more important than any individual”. We worked to complete the task and went through Bruce Tuckman groups develop through five basic stages: Forming – apprehension, Storming – conflict, Norming – status and role attainment, performing – goal striving and accomplishment, Adjourning – disbanding or re-organizing (Thompson 2010: 92). No one had been nominated as leader but there were two definite leaders who took on the role of deciding what task each of us should do. This occurred as a result of the two feeling that they were going to take on more, we let them take the lead due to their willingness to undertake the greater part of the task. Despite this I managed to take charge when it came to the title and how information was displayed. Due to the lack of clear leadership this meant that we did not always meet up and there was no time to rehearse before presenting to the class. Each team member was given a task to complete but due to lack of clear roles and responsibilities and we got on to complete the task at hand. According to Thompson (2009:160) “good practice is based on partnership, team work and good communication amongst all members”. It was essential to create positive group dynamics as this would aid the relationship between the team members, as such the relationship had to be constructive as well as productive (Lafasto & Larson 2001). Belbin (1996:64) stated “that an approach to human relationships in work groups, in which each individual has a defined role”. In this case there were two people that were the leaders and they were dominant in making decisions without consulting the rest of the team. In relation to team roles I took on the role of resource investigator Belbin (1981: 84) describes this as a person that is very optimistic. I endeavoured to relay my opinion in order to contribute and make corrections as expected by the group but to my work was disregarded in my absence. There are a number of issues that can affect a good group dynamic and for our team it was poor communication, different information would be passed on yet after meeting the other teams had done something differently. This factor I believe affected my performance and others as well. For instance we emailed each other what our ideas but the two leaders were negative towards my suggestions and the responded in a way that demonstrated decisions had been made already. Furthermore not all members received updates due to not being linked in so there was missed information, at the time of presenting suggestions on how it should be done were ignored this was annoying and evoked some strong emotions. Unfortunately it was late to resolve this issue I felt strongly that decisions were made without critical analysis and this was a direct result of lack of leadership. When we started to develop the poster we recognised that we had limited time, space and therefore we decided to develop a poster that was precise, concise and easy for the social work students and service users to understand. The purpose was to inform and provide an understanding of about the social theory for practice and also how well it works with service users. It was also essential for the design and colour scheme of the poster to be practical. According Fook et al (2007:54) states that “depending on visual workshops students or people are more likely to remember colourful presentations and are drawn to them”. clear and precise on the subject matter, but despite this I felt that the poster should have been more about the social work theory for practice than the subject depression. The arrangement of information was sufficient considering the information that had to be gathered but it would have been better to have less information on the poster. The poster illustrated clearly that the service user was the expert of their own recovery and this in turn empowered them in making good choices, this evidently highlights the advantages and disadvantages of the person-centred therapy. Trevithick (2012: 91) emphasised that social workers should work with service users holistically in order to get a better understanding of their life. Service users and carers express that the most essential quality they would appreciate from social workers is understanding and patience. This I believe was as a result of the fact that social work theories and service policies vary in their assumptions on the nature of service users, their problems, society and role of social workers. Whittington et al (1995:27) states that “when a social worker makes sense of a problem or issue he or she also makes certain assumptions”. This is subjectivist philosophy and works with free will. It deals with insider’s view, self determining ways and human nature for instance dealing with the relationship that the client has with the social world around them (Stepney et al 2000). The poster did not illustrate the advantages of the usage on the therapist this was due to limited space and only focusing on the service user. For instance a therapist may not feel weighed down while working with a service user who is aware and more positive this will empower the therapist as well as the service user. Rowe and Llic (2009) stated that “posters are brilliant way of transferring knowledge and suitable form of educational publication”. He further emphasised that people are more likely to be drawn to visual elements of a poster than the subject or content and it was essential for the author to include their name in order to effectively convey the educational subject matter. As a student social worker I have to critically analyse and appraise the social work theories there are six critical criteria’s namely; Subjectivist- objectivist = philosophical position, Theories of society= provides an explanation, Research and research evidence= provides evidence and credibility to theories, Ethics and theories of social justice =provides understanding against the BASW codes of ethics and values, Service user and carers perspective=an insider perspective and Model of practice= theories are in context. There are six theories in social work practice namely psychodynamic theory, Social learning theory, Theory of moral reasoning, systems theory, conflict theory and theories of cognition. The person-Centred approach was adopted work of the psychologist Dr Carl Rogers (1902-1987),the approach was psychotherapy and counselling. He believed that “the basic nature of the human being, when functioning freely, is constructive and trustworthy”(Rogers 1961:94). The Person-centred approach (PCA) “is an emotional and psychological approach to the person a ‘way of being’, from which perception of self, reality and behaviour may be reorganized. Its underlying principles are “the primacy of the actualizing tendency, the assertion of the necessity and sufficiency of the therapeutic conditions and the realization on the part of the therapist – of a non-directive attitude” (Rogers 1947). According to Thorne (1991:36) “one of the limitations of person-centred approach resides not in the approach itself, but in the limitations of particular therapists and their ability or lack of it to offer their service users the required environment for transformation and development”. Thorne on the other hand unreservedly accepted that in his own experience, there are particular kinds of service users who are unlikely to be much helped by the approach. Furthermore Christopher (1996:22) concurred that “there are sincere attempts to understand our own motivations, theories, service users are best achieved through considered and critical dialogue and reflection.” Nevertheless person-centered approach is very relevant in social work practice and this approach as “a psychosocial approach takes into account that people have both inner worlds and outer realities but the way we perceive the world sometimes differs from the way others see it” (Coulshed & Orme, 2012:108). An internet search on PsycINFO revealed 612 educational journals on person-centred therapy of these 411where peer reviewed journals the data was gathered from a range of groups, ages and genders. The bulk of the studies demonstrated that person-centred approach is essentially effective in getting results with service users to transform their lives. There is research evidence on the use of person-centred approach or therapy in mental health settings with adults, children and older people. It is essential to note that despite the fact that it has been used in cognitive behaviour therapy has also shown that it is a successful implement. There are a number of other approaches for instance pharmacological, psychodynamic and psychoanalytical evidence has shown that as a course of action it is short term but it is better to have intervention than non at all. The observed research, analysis as well as other types of research are vital in appraising the social work theory for practice. Orme et al (2010:159) stated that “when one finds research or peer reviewed journals there are questions to be asked for instance who owns the research and what their objective is”. Christopher, J.C. (1996) Counselors’ inescapable Moral visions Journal of Counseling and Development, 75, 17-24. Coulshed, V and Orme, J. (2006) Social work Practice, 4th Edition, and Palgrave Macmillan. Fook J and Gardner F (2007) Practising critical Reflection, A Resource Handbook, Open University Press. Healy, K. (2012) Social work methods and skills, the essential foundations of practice Palgrave Macmillan. Hogg, Micheal A, Vaughan, Graham, M. (2005) Social Psychology 4th Edition Pearson, Prentice Hall. Howe, D. (2009) A brief introduction to social work Theory.Basingstoke; Palgrave Macmillan. Orme J and Shemmings D (2010) Developing research based social work practice, Palgrave Macmillan. Stepney P and Ford D (2000) Social Work Models, Methods and Theories, A framework for practice, Russell House Publishing. Stogdon C and Kiteley R (2010) Study skills for social workers, SAGE publications. Thompson N (2009) Understanding Social Work, 3rd edition, Palgrave Macmillan. Trevithick P (2012) Social Work Skills and Knowledge, a practice handbook, 3rd edition, Open University Press. Wilson K, Ruch G, Lymbery, M and Cooper A (2008) Social Work, An introduction to contemporary Practice, Ashford Colour Press Ltd.
"Person Centred Approach for Depression." UKEssays.com. 11 2018. All Answers Ltd. 04 2019 <https://www.ukessays.com/essays/social-work/person-centred-approach-depression-4112.php?vref=1>. "Person Centred Approach for Depression." All Answers Ltd. ukessays.com, November 2018. Web. 25 April 2019. <https://www.ukessays.com/essays/social-work/person-centred-approach-depression-4112.php?vref=1>. UKEssays. November 2018. Person Centred Approach for Depression. [online]. Available from: https://www.ukessays.com/essays/social-work/person-centred-approach-depression-4112.php?vref=1 [Accessed 25 April 2019]. UKEssays. Person Centred Approach for Depression [Internet]. November 2018. [Accessed 25 April 2019]; Available from: https://www.ukessays.com/essays/social-work/person-centred-approach-depression-4112.php?vref=1.